Grilo has created Grilo Cricket Energy Bars. Sustainable cricket protein is the hero ingredient in the latest energy bar innovation launched in Australia. Australian company Grilo is one of a handful of companies that uses crickets in packaged food products. 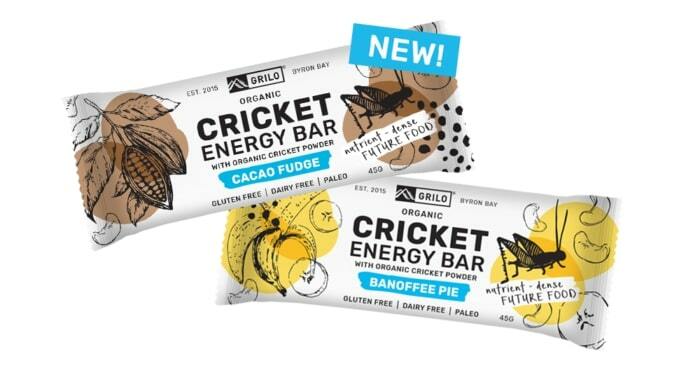 It’s been selling cricket flour and superfood blends for more than a year, recently introducing the protein in a bar to so consumers can easily introduce crickets into their diet. Co-founder Lucas Becker said while Grilo was slightly ahead of the curve, sales were growing nationally in health food stores, petrol and convenience, and independent grocery via majors like Flannerys, Go Vita and select IGAs. So perhaps we shouldn’t be surprised after all. There’s growing conversation around the world about sustainability and Australia is no different, with the case for “clean” or lab-grown meat gaining momentum and expected to be available for sale laster this year. Crickets are high in sustainable protein and have been long flagged as the future of food. While Australia has been slow to the game with only a handful of companies using the bug in packaged food products, they’ve been growing in popularity around the world including the US and Canada, which is where the Grilo crickets hail from. Mr Becker says China, Singapore and Japan are the worlds largest consumers of crickets. “In Australia we have such a good reputation for being a green country and having organic standards – there’s a huge opportunity for Australia to be supplying these markets,” he said. Crickets are a nutrient dense food containing 69 per cent protein, all nine essential amino acids, Vitamin B12, essential omega 6 and omega 3 fatty acids, iron, potassium and calcium. There are also significant economic and environmental reasons to be eating insects. Crickets require less land, water, feed and energy than many other popular protein sources including beef, chicken or pork. Mr Becker said the earliest records of people eating insects were from 10,000 BC in the Mediterranean and Egypt. It was thought the consumption of insects declined as modern agriculture grew (and they were thought of as pests because they ate the livestock’s food). Grilo Cricket Energy Bars are organic, gluten free, dairy free, non-GMO and paleo. Available in Cacao Fudge & Banoffee Pie. Mr Becker says they taste like any other energy bar or bliss ball with the taste of 5 per cent crickets barely detectable above the bend of dates almonds, chia seeds, and cacao.